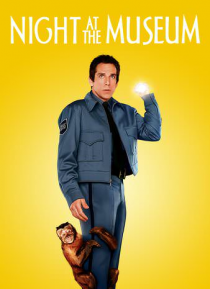 When good-hearted dreamer Larry Daley is hired as night watchman at the Museum of Natural History, he soon discovers that an ancient curse brings all the exhibits to life after the sun sets. Suddenly, Larry finds himself face-to-face with a frisky T. Rex skeleton, tiny armies of Romans and cowboys and a mischievous monkey who taunts him to the breaking point. But with the help of President Teddy R… oosevelt, Larry may just figure out a way to control the chaos and become a hero in his son's eyes.